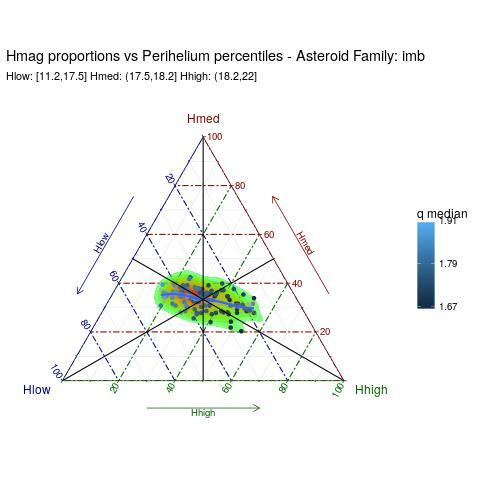 Inspired by these beautiful examples, I have tried to use the ggtern R package to draw a few ternary maps showing how the H mag of various asteroid families varies as a function of q, i.e. 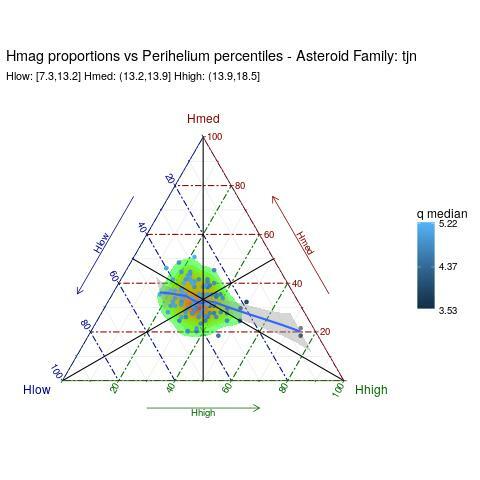 the perihelium distance. ....consisted in downloading the parameters a,e,H from the JPL Small-Body Database Search Engine. After that, I divided the H range into three parts: Hhigh (upper 1/3 of the H range), Hmed (medium 1/3 of the H range), Hlow (lower 1/3 of the H range). Then, I determined the perihelium percentiles (and their median q_median). 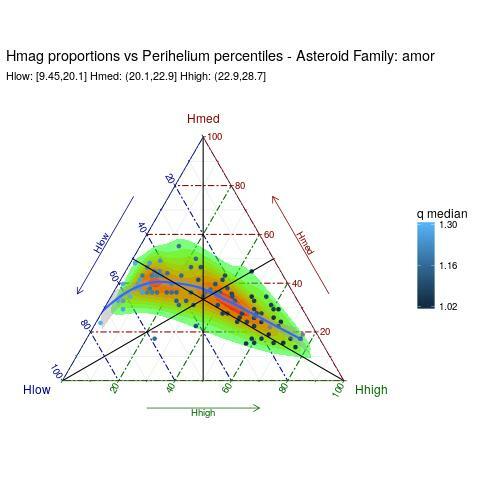 Finally, I built a table displaying the proportions of Hhigh, Hmed, Hlow in the various perihelium percentiles (of course, the sum of the proportions in every percentile has to be 1 while the three individual proportions might be different from 1/3 - thus, a ternary map can be used to represent the various proportions). If you are interested in the R programming details, look at the bottom of this post: I have used the R markdown language to embed the R script used to draw the ternary map for Apollo asteroids (by changing the name of Apollo with Amor, Imb, Omb, Trojan, Mars Crossers, TNO ... 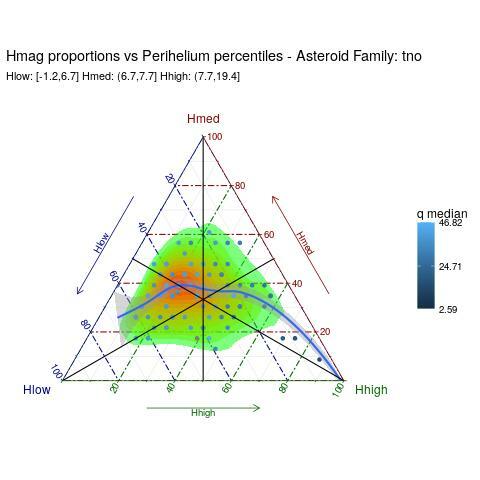 I got the similar maps for these other asteroid families). every dot has three coordinates (the sum has to be 1) representing the proportions of Hhigh, Hmed and Hlow asteroids. a dot near the barycenter has the same proportions of Hhigh, Hmed and Hlow (1/3+1/3+1/3). a dot very near to a vertex (if any) - say Hlow, it would represent a percentile where Hlow is almost equal to 1, while Hmed and High are negligible. a dot on a median - say the one connecting Hlow, it would represent a percentile where the High and Hmed proportions are the same. ##   Vienna, Austria. URL https://www.R-project.org/. ## 'citation("pkgname")' for citing R packages. ##   Hadley Wickham (2007). Reshaping Data with the reshape Package. ##   the Creation of Ternary Diagrams. R package version 2.2.0. ##   H. Wickham. ggplot2: Elegant Graphics for Data Analysis. ##   Springer-Verlag New York, 2009. ## Even small amounts (say $10-50) are very much appreciated! ## Remember to cite, run citation(package = 'ggtern') for further info. ## Using Freq as value column: use value.var to override.